What little is known about the Englishwoman Elizabeth Gordon's life stems from her early involvement in George Ivanovitch Gurdjieff's Institute for the Harmonious Development of Man in France and her role as group secretary to the all-female study group known as "the Rope." 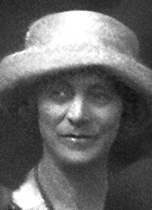 Loyal to Gurdjieff, she remained in Paris during the German occupation. Toward the end of the war she spent a period in an internment camp as a foreign national.1 She was released due to age and died in Paris soon after in 1945. Elizabeth Gordon was one of the first to come to the Institute in October 1922, when it first opened, and she devoted the rest of her life to the Work. She experienced first hand many of the most significant events of Gurdjieff's life and teachings. In 1935 Gurdjieff formed the Rope. It was composed of Solita Solano, Kathryn Hulme, Jane Heap, Louise Davidson and Alice Rohrer (Georgette Leblanc and Margaret Anderson later became members). He said to the women, "Mees Gordon will be like Mother Superior for you and you must treat her as such." Gordon apparently never married, and was the only heterosexual member of the predominantly lesbian Work group. Other members of the Rope considered Gordon a prim and proper lady. She was deeply devoted to Gurdjieff and understood his unusual methods of teaching. Kathryn Hulme writes that each member of the Rope represented a different Way. Of Miss Gordon, she said, "she appeared to represent bits and parts of all three ways, in her Fakir's endurance, her monkish emotions and, occasionally, in her yogi-like response quick with recognition to one of Gurdjieff's references to the early days. "2 Curiously, all the members of the Rope were given names that referred to their animal nature except Elizabeth Gordon. 1. William Patrick Patterson, Voices in the Dark (Fairfax, CA: Arete Communications, 2000), 149. 2. Patterson, Georgi Ivanovitch Gurdjieff (Fairfax, CA: Arete Communications, 2014), 312.